UW alum Jovon Bouknight seems to be making a positive impression on the Carolina Panthers. 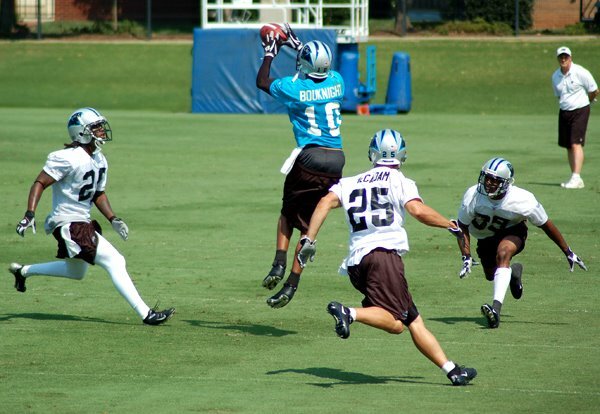 "The Carolina Panthers may have found a hidden gem in undrafted free agent Jovon Bouknight. Signed by the Carolina Panthers on 5/5/06, Bouknight has shown great promise during the offseason voluntary "summer school" workouts. He has shown the ability to seperate from his defenders and demonstrated solid hands when given the opportunity." Bouknight ran a slow 40 at the Combine and teams stayed away during the draft, but all you had to do was see him play at Wyoming to know he was faster than his Combine time. I think you've done a very nice job with your blog. I have had a chance to browse your site and I think many people would enjoy reading it. I would like to link to your site from my site. For the past few months I have been working on my site www.writeonsports.com. It is still in the process of being developed and will be finalized in the next month (or so). The premise of the site is to provide a centralized area where independent people, who like to write on sports or read about sports, are able to find articles/authors they enjoy. As part of my website, I am going to provide a "sportsblog library". This will provide readers a searchable data base to find the sports teams that they enjoy reading about. I would like your site to be part of the sportsblog library. If someone searches for Wyoming sports they would be able to find a link to your blog. I would request you tell me exactly what sports you will focus on (if you, indeed, are going to continue this blog). I am not looking for a straight listing of all the blogs that relate to each team; I am looking for a place where someone can go and find a well written blog that offers information to the knowledgeable reader. I think your site provides such a quality. As such, I would like to invite you to be listed in the sportsblog library. Anyway, I look forward to your response and I hope you will accept my invitation. WYO WR Wins Big on "Wheel of Fortune"